Since the election, we’ve made it our mission here at FiveThirtyEight to uncover the variables that best explain why things shook out the way they did. We’ve already shown you the strong correlation between partisanship and U.S. House results. We have also pointed out how Republicans won a huge share of rural seats, while Democrats won every single urban seat and many, many suburban seats. Today, we’re taking a look at how well educational attainment predicted the 2018 House results, especially among non-Hispanic white voters. As we noted, this trend was already evident in 2016. 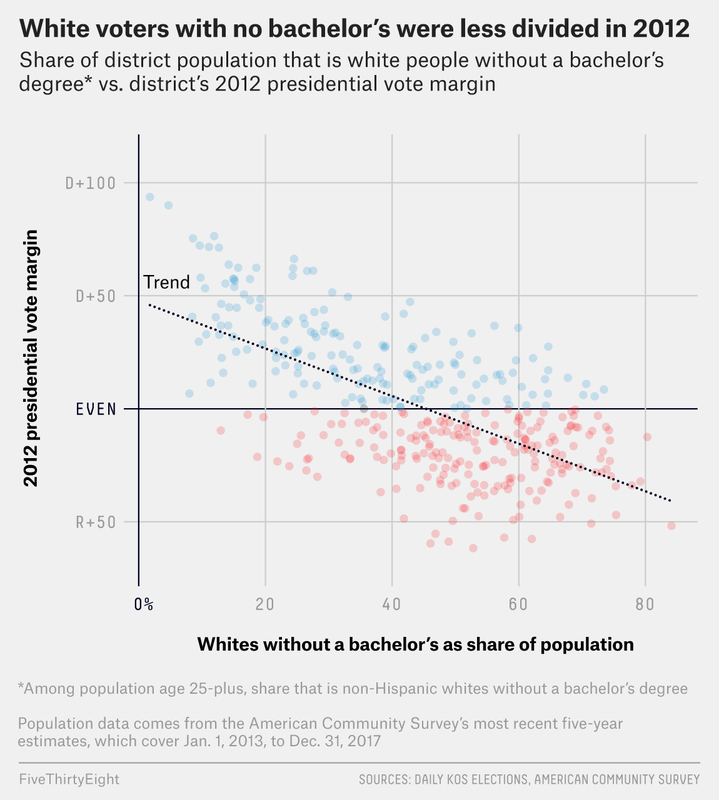 Indeed, a district’s share of non-Hispanic whites without a bachelor’s degree was slightly more predictive of how it voted in the 2016 presidential election than in the 2018 U.S. House election: The correlation coefficient between Hillary Clinton’s vote margin and the percentage of the district that was white people without a bachelor’s degree was -0.79 in 2016, compared with -0.72 in 2018. 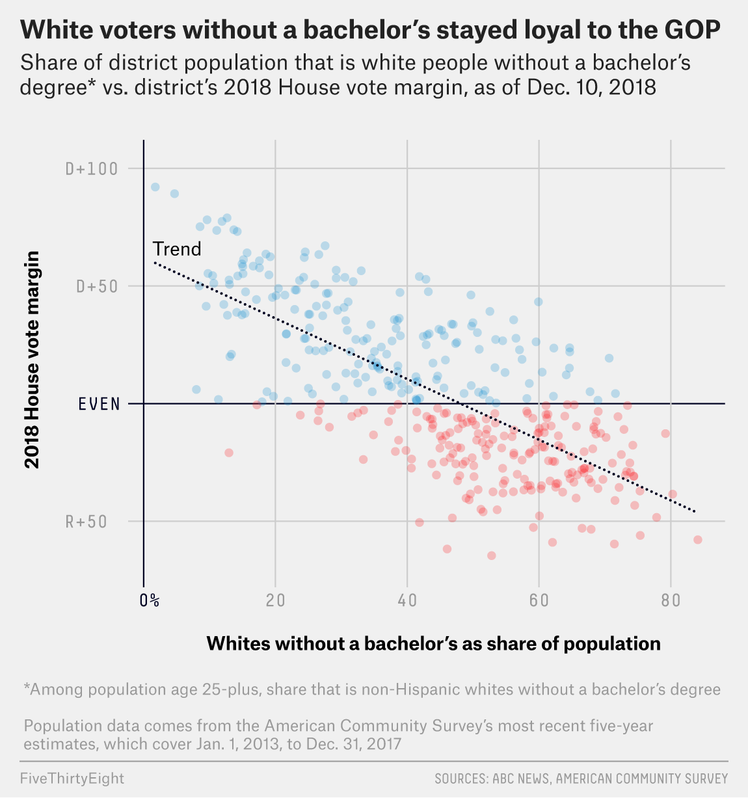 However, the relationship was less pronounced in the 2012 presidential election — the correlation was weaker (R = -0.64) and the partisan gulf was smaller between districts that had a high percentage of white voters without a degree and districts where that percentage was lower.2 Put another way, the new demographic coalitions in the Democratic and Republican parties had not yet fully coalesced. 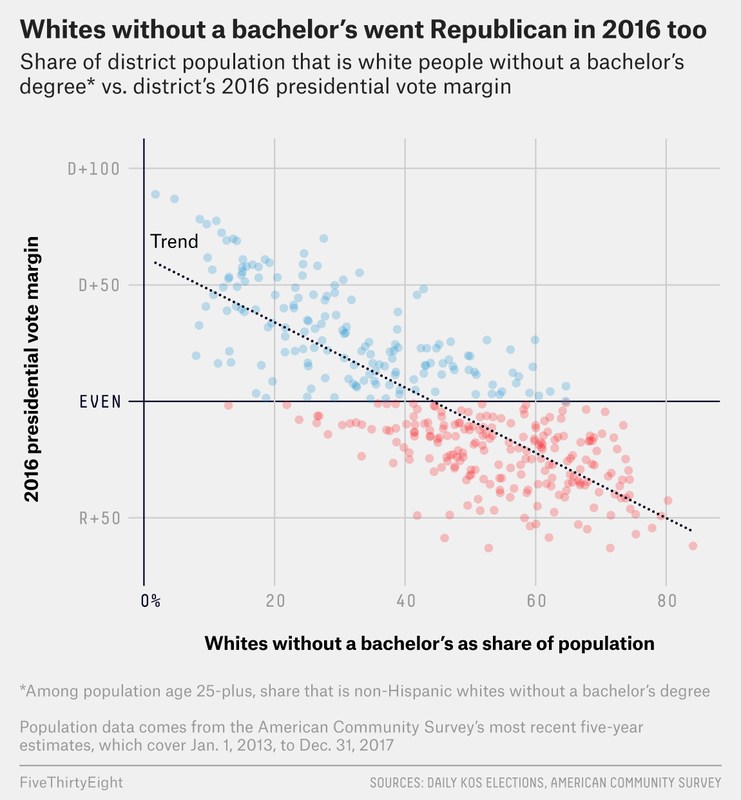 In terms of white voters’ educational attainment predicting election outcomes, 2018 represented a middle ground between 2016 and 2012. Voters neither snapped back to their pre-2016 preferences nor remained quite as divided by education as they were when Trump himself was on the ballot. It’s a confirmation of other analysts’ findings that the 2018 election results represented a blend of 2016 and 2012 partisan baselines. And it answers a question that we posed before: Would Democrats be able to build on their 2016 gains in diverse, upper-class suburbs to make states like Texas competitive? Based on the 2018 election results, it looks as if the answer might be yes. Education as a major factor in vote choice is here to stay. Demographic statistics are five-year estimates from the U.S. Census Bureau’s 2013-2017 American Community Survey, the most recent numbers available. The election results used in this article are up to date as of Dec. 10 at 2:30 p.m. Eastern. We excluded elections that did not feature both a Republican and Democratic candidate, as well as every House race in Pennsylvania. Because Pennsylvania’s congressional map was redrawn shortly before the 2018 midterms, demographic breakdowns of the new districts are not yet available from the U.S. Census. We’re still using the five-year estimates from the 2013-2017 American Community Survey here. The ACS collected data for this estimate starting Jan. 1, 2013, so it’s not a perfect picture of what the population was like in November 2012, but the differences are likely very small.